Last week I bought a crate - yes, an entire crate - of peaches from the farmers market. It was an impulse buy ignited by the fact that we arrived late to the market and all I could seem to notice were other market goers happily strolling by, their fine peaches already claimed and brimming over the tops of their shopping bags. Also, because Sarah had just purchased a beautiful looking peach and brown butter crepe, which she refused to share (but let me smell) and then proceeded to sit and leisurely eat while I sweated it out in the peach stand line alone. So much for farmer's market solidarity. So, determined to make my own, better, more delicious peach crepe (take that Sarah) we ended up wrestling an entire crate of plump Red Havens home on the El. I ate one en route and we donated two to the homeless and very boisterous gentlewoman who frequents our block. Still there wasn't enough room in the fridge to house them all. We had peach smoothies for breakfast three days in a row, grilled a bunch with pork chops, tossed them in arugula salads and froze some more for future smoothies. By Monday there were, amazingly, only five left and I had them slated for a dessert. Beignets. Vanilla bean and sea salt beignets to be exact. With - you guessed it - peach compote. And this isn't any ordinary peach compote. It's peach compote with ginger and flecks of Meyer lemon rind! This dish is everything I look for in a summer dessert. Seasonal, light (sort of - beignets are deep fried) and delicious. Make no mistake, this compote is definitely sweet. Peaches have a lot of natural sweetness and a compote by definition is "fruit cooked in sugar syrup" which makes the addition of lemon rind and sea salt important for balance. Using sea salt that comes in larger granules is best as they usually won't dissolve completely in the frying process and create tiny bursts of saltiness. 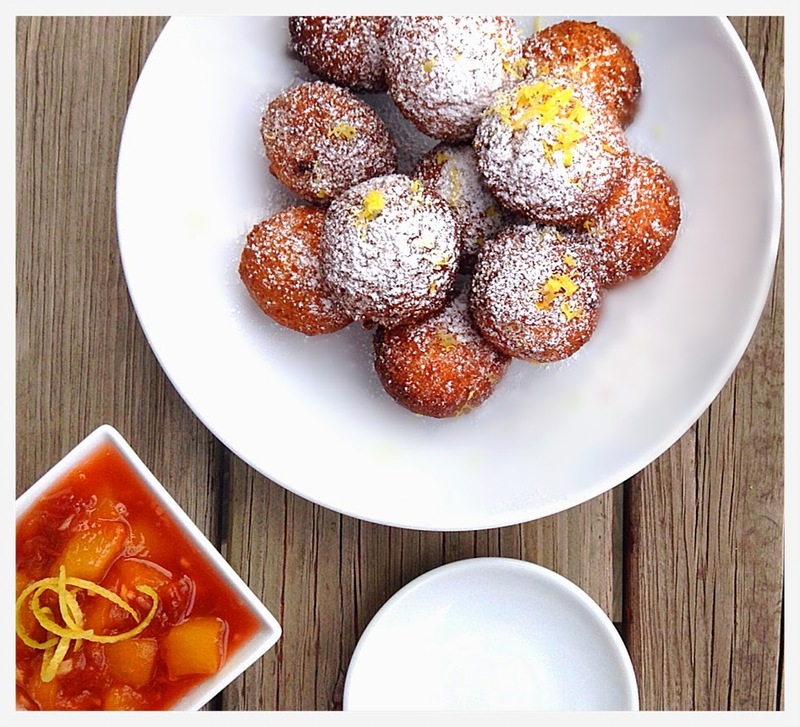 Just as the sweetness from the dough and the compote are reaching a crescendo … Pow! In comes a welcomed salty zing! … In 25 minutes is a real added bonus. I chose Revolution Brewery's Cross of Gold Golden Ale to pair with and the result was even better than I'd expected. The sweetness mellowed the hops to such a pleasant degree that even beer-critical Sarah exclaimed at its balance. I'm almost counting the days until fall when I can make these with caramelized apples or pear butter! Enjoy! In a bowl combine all dry ingredients (flour, sugar, baking powder, and salt) and mix well. In a second bowl mix all wet ingredients (milk, eggs, butter, vanilla, and lemon zest). Gently incorporate the wet ingredients into the dry to form a wet dough. Let it rest for 20 minutes. Roll the dough into 1 oz. balls, about 20 in total. Fry for 5 minutes and cool on paper towel to drain off any excess grease. Combine all ingredients in a sauce pot and place on medium heat, stirring constantly. Once the sugar is dissolved, turn heat to high and cook for 5 more minutes, continuing to stir. Chill or enjoy warm. Garnish with lemon rind. Enjoy! This beer pours a golden hue with a thick and sturdy white head. The aroma is lemony with mild notes of spice. Up front the flavor is bright with American hops and a mild maltiness. Its bright florals and citrusy hops balance the spice and sweetness of the malts. This beer's carbonation is crisp and the flavors are just complex enough making this a great choice for easy summertime enjoyment. The pairing is a fairly straightforward comparison. The flavors from the food and the elements of the beer mirror each other to create a harmony on the palette. 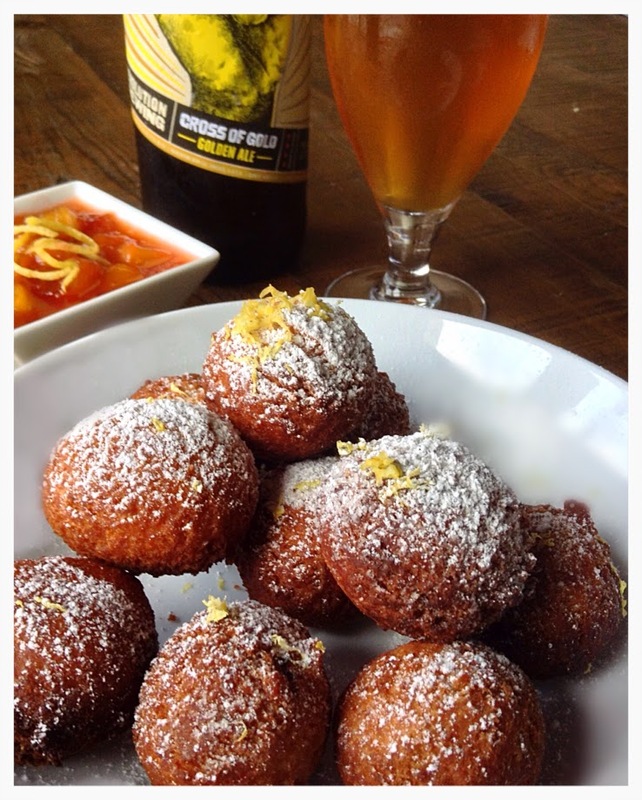 The lemon zest and vanilla bean from the beignets replicate the aromatics in the beer and the lightly fried dough emulates the character of the mild maltiness. The citrusy hops not only play off the lemon in and on the beignet but, like the beignets, are a nice complement to the ginger in the compote. Additionally, the brightness of the hops and the crispness of the carbonation help to smooth the sweetness of the compote while, in turn, the sweetness serves to mellow the hops.